In an earlier post I looked at how charities can use digital to improve their provision of static information, and to provide proactive advice and support. But that is still quite a one-sided interaction, with organisations being in a position of power and enlightening their beneficiaries. What could happen if we go beyond the idea of service provision? Organisations with social, political, cultural or economic aims want to change people and the world. We know our objectives, and so do our supporters. We could use digital to work together more closely to get things done. This is where digital gets really exciting, and it’s the part we haven’t figured out yet. I propose that we take our implementation of the social web a step further. By enabling people to connect and plan and create ideas and drive change, digital can change the world. As charities, our job is to help facilitate this but not to lead it – at least, not to lead it in the way that we tend to think of leadership. Rather, we’re thinking about nurturing spaces for self-organisation, collaboration, network formation, knowledge and content creation. Not telling people what to do, or what’s best for them, but letting them decide for themselves, and supporting without stifling. This will feel creative, exploratory, emergent, chaotic, and probably a bit risky and uncertain. Facilitating this in a a digital space is going to take something better than a walled platform owned by an organisation with corporate interests and an ability to control what people see. So Facebook probably isn’t the ideal space for this. But there may be a problem if any organisation – even a charity – is perceived to own a platform or network, more than the people that make up that network. What does national campaigning for a charity look like now? Sign up for a mailing list. Receive emails from time to time. These emails update you on what’s happening and ask you to take a range of different actions to help the organisation campaign. When your interests and the request from the organisation intersect, you take action. What do charity networks look like now? Charity networks seem to largely exist offline, or at least in silos. Initiative seems to come from the centre – the national organisation – rather than arising out of the network. Opportunities for communication and agency between nodes in the network are limited. UNICEF’s network seems to exist mainly in specific discrete geographical locations – see its Schools Campaign Network and its regional fundraising groups. Involvement in the international cause is channelled through a national organisation, which directs the activity of local groups. 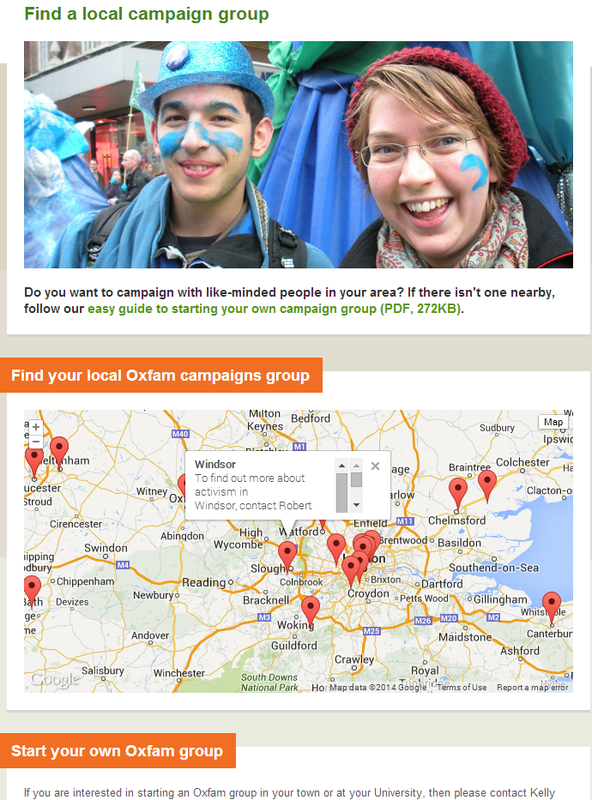 Oxfam lets you choose to take part in an action, but doesn’t seem to be focused on letting you set direction. Just like with UNICEF, Oxfam’s campaign groups seem to mainly exist as an email address on a map, rather than a live conduit into a trouble-making world transforming network of energetic activists. I wonder if these groups could be in touch with each other more powerfully, and work together more ambitiously? What about Oxfam’s communities platform? It seems to be based around fundraising groups and get togethers. I wonder if this space could also be used as a hub to plan projects? Again, like UNICEF and Oxfam, their local groups live in a directory, separate from each other and on separate websites. (To start a group, you have to fill in a word doc, pay a membership fee, and send it back to the central organisation.) Local organisations being separate makes logistical sense, but in some contexts we want to aggregate them and combine them so that they become something greater. We want the living network to be more than a list of names in a PDF. What about Avaaz? That’s an international grassroots campaigning network, isn’t it? My main experiences of Avaaz have been receiving an email telling you to fill in a petition. Upon filling it in, you’re taken to a page placing your action in exciting real-time global, and quite personal, context. This is cool, but this action was still directed by the organisation. 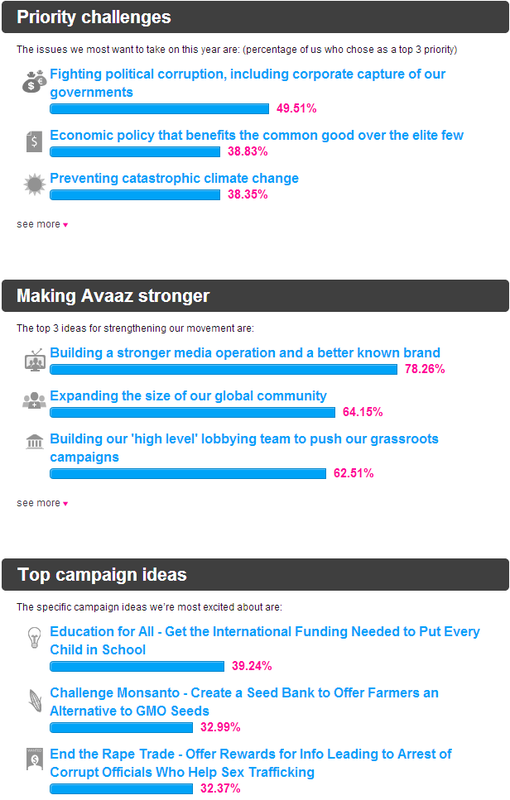 Avaaz has made moves towards empowering its network. I’ve been impressed to see the annual objective setting questionnaire, through which members contribute to the prioritisation of campaigning activity. 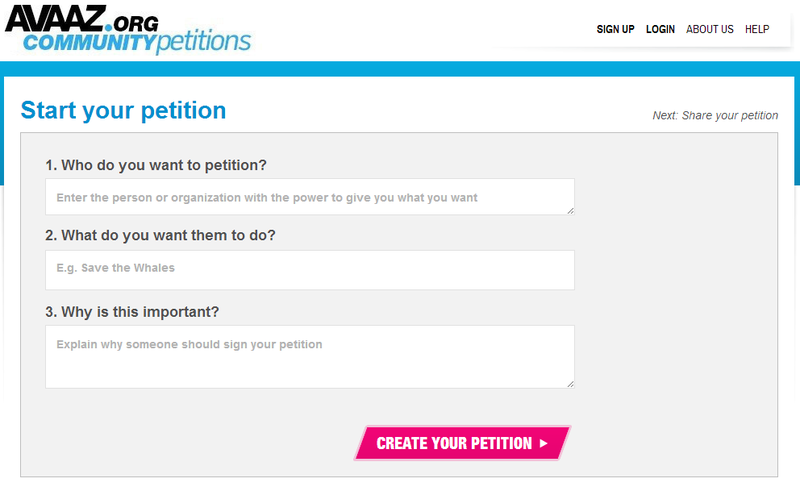 I’m also intrigued by the newer Start your Own Petition functionality. I don’t know how much organisational intervention or vetting there is on these petitions. Metaphors of control and power; insiders and outsiders; sailing ships and motor boats. Alice Jay, a campaigns director for Avaaz, explained that “We’re like a sailing boat, not a motor boat.” I think the metaphor here is that the organisation’s supporters are like the wind behind a sailing ship. The staff of the organisation have to work out the nuances of the route, they have to sort out the logistics and worry about avoiding risks, but the general direction of travel is powered by the supporters. Supporters don’t need to worry about finesse, or to have too much knowledge or skill – they just need to keep the wind blowing. A motor boat, by contrast, would be an organisation doing things under its own power – not dependent upon outside support. But what if the direction of supporter enthusiasm is at variance to the presumably high-quality expert insights of people inside an organisation? What if the direction of popular enthusiasm seems like it’s heading for the rocks? I prefer metaphors of sailing boats to metaphors of galleys. A sailing boat organisation is powered by supporters, moving towards a shared objective, with the details of the journey worked out by those on the ship. A galley organisation, by contrast, would have its supporters on board, but they wouldn’t set the direction, and would be told when to row. Can we go beyond metaphors of insiders and outsiders? The sailing boat metaphor still relies on a distinction between those inside the organisation and those outside it. Why is that necessary? So I don’t necessarily think that the outsider vs insider dichotomy is something we need to trip up on. Movements like Anonymous, the SOPA blackout, the arab spring and Occupy suggest that people are able to come together, making use of digital channels, to achieve change. Which charities are doing this sort of thing already? The draft of this blog was written in January 2013, but never brought to completion. I decided to finish it off and post it today.